If Quebec Transport Minister Robert Poëti and Montreal Mayor Denis Coderre have their way, Montreal’s fragmented public transit system is in for a major overhaul. Their proposal is similar to governance models seen in other metropolitan regions, but will it work in Greater Montreal? Like many regions in the world, Montreal has a fragmented governance system made up of a regional authority and municipal governments. Municipal transit agencies or transportation departments run their own systems and oversee their own funding while the Agence métropolitaine de transport (AMT) is responsible for parking lots, commuter trains, reserved lanes and metropolitan terminuses. The AMT is under the governance of the Québec government, and the region’s municipalities provide 40% of AMT’s budget. Every region outside Montreal, Laval, and Longeuil currently has its own Conseil intermunicipal de transport (CIT), the new plan calls for them to be merged into one authority along with the AMT. Montreal, Laval, and Longueil will retain their Sociétés de transport. Responding to demands from elected officials in the Montreal region, the Quebec government’s new governance proposal is based on a new provincial-municipal partnership involving the member municipalities of Communauté métropolitaine de Montréal. 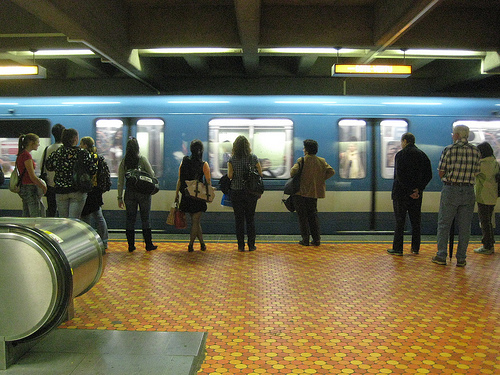 The plan is to assign public transit planning to a regional transport authority (ART) with six members appointed by the CMM and seven by the Québec government, including an independent chair. A metropolitan transit system (RTM), headed by a board of elected officials designated by the CMM will run the commuter trains, suburban buses, reserved lanes, parking lots and terminuses. Coderre maintains that with the adoption of the PMAD, which the CMM laboured over for more than a decade and approved in 2012, the governance partnership will “facilitate the creation of a unified vision of Greater Montreal.” A regional approach to transportation and land use planning is rare, not just in Canada but around the world, as I learned in my meta-analysis of 11 international city-regions. However, some mayors are concerned that an AMT with greater planning discretion will reduce their autonomy and lengthen the process of approval for critical transportation decisions. Some of the municipalities use private companies to deliver public transit, so service changes can happen within days or weeks. In Montreal, this type of decision must be studied and ratified by board members, so changes can take months. Raphaël Fischler, Director of the McGill School of Urban Planning, goes even further in his criticism of the plan, saying that local mayors “have a poor track record of decision making on urban and regional transportation planning in the region.” He cites a critical reason that those in the planning profession have heard before: elected officials tend to prioritize long-term local concerns over long-term regional concerns. These are not new concerns: it’s well known that Vancouver has also struggled with regional transportation governance and is currently going through a referendum on the issue. Until 2007, TransLink’s board was made up of elected officials from the Metro Vancouver municipalities, with a few provincial representatives. The board held public meetings and its decision-making was generally considered to be transparent, if not harmonious. Transport Minister Kevin Falcon ordered a change, retaining a Mayors’ Council (with all 21 mayors in the region, the Chief of the Tsawwassen First Nation, and a representative from Electoral Area A) but weakening the ability of the Council to make regional decisions. A governance review in 2013 revealed major issues with accountability. In response, the Province of BC introduced governance changes last year returning regional decision-making to local mayors: the Mayors’ Council shares responsibility with the board of directors (with nine members appointed by the Mayors’ Council and two by the province). The 2014 governance changes eliminated the Regional Commissioner of Transportation and the ability of the provincial government to set the regional transportation vision. Metro Vancouver provides input on long-term strategies and planning, and the province on long-term economic, environmental, and transportation objectives. The referendum that Metro Vancouver residents are currently voting on concerns the long-term transportation strategy prepared by the Mayors’ Council. If Vancouver’s experience is an illustrative example, it’s likely that the Montreal region will stumble a little if this new governance model is introduced. Planning operates in a fragmented governance framework that has always made longer term, regional initiatives difficult to develop and implement. Governance expert Andrew Sancton has written that regional governance initiatives are often seen as eroding the power of local councils. It will take municipal planning departments and elected officials a while to adjust to thinking in these terms, to thinking as one as they develop a regional vision that will guide their decisions. And as Sancton noted, restructuring is only part of the answer to successful governance within a region: partnerships with the private and non-profit sectors are critical to improving quality of life. Montreal’s struggle with regional transportation governance is one shared by most metropolitan regions in the world.